For over the past two decades I have used the initials NWL to stand for Nazi War Loot. To give you the scale of looting during World War II the Nazi’s stole 26,000 railway cars full of art from France alone. My involvement started in 1996, when one evening on the corner of Madison Avenue and 79th Street in New York City, the director of the Metropolitan Museum, Philippe de Montebello, stopped me in the street as he was leaving, and I was entering a gallery opening. He wanted provenance documentation. 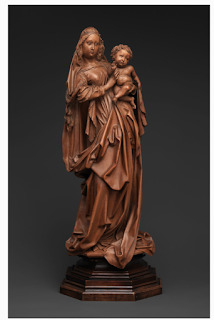 The Met had just made a much ballyhooed acquisition of a small medieval boxwood Madonna and child attributed to Niclaus Gerhaert, Austria, circa 1470. Because of its 3 million dollar price tag and knowing that my family gallery, Rosenberg & Stiebel had once handled it, I had already looked it up in our archive and found we had sold it in 1948 from a Rothschild collection to a German dealer for $300. So my response to the director, who I thought was joking, was “Philippe, you paid 3 million and we sold it for $300 and you want me to do the work?.” Sure, enough the next morning I heard from an old friend, the chief curator of the medieval department, William Wixom, asking me the same question. So I went back into our archive and gave him the details including the date of purchase from Baroness Clarice de Rothschild in 1947, shortly after the Baroness had recovered the family collection pillaged by Goering for Hitler’s projected museum in Linz, Germany. We had sold it to Galerie Böhler in Munich. Almost a half century later, one of Böhler’s heirs sold the piece to the Met. Even though my father had told me that Julius Böhler was always friendly to my family and the Jews, he is thought today to have been one of Hitler’s art dealers. Only when I learned this did I understand the reason for the extra research. Then at the end of 1998 there was a conference in Washington D.C. based on the following: “In developing a consensus on non-binding principles to assist in resolving issues relating to Nazi-confiscated art, the Conference recognizes that among participating nations there are differing legal systems and that countries act within the context of their own laws.” But they came up with concepts that countries to a greater and lesser extent have tried to follow, including the identification of works or art whose provenance between 1933 to 1945 was in doubt. 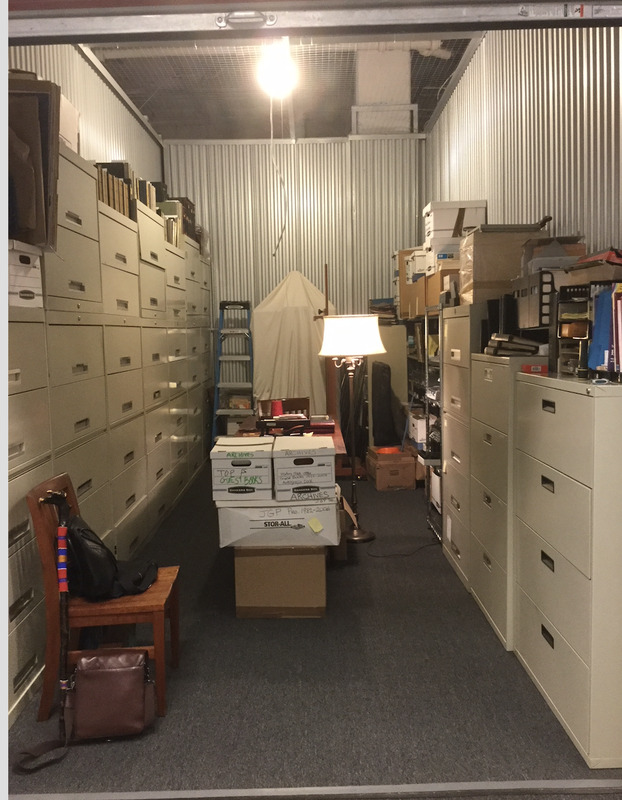 From then on, I received continuous requests from Museums to do provenance research in our archives. I started out doing it without charge but it took up more and more time and when we moved to Santa Fe I had to hire someone to do the research in in New York, so I began to charge a fee. I got deeper into the question of Nazi War Loot (NWL) in 2005 when Markus Stötzel, a lawyer from Marburg, Germany, got in touch and told me of possible NWL that had been taken from my family by the Nazis when they had been put out of business twice in Frankfurt where the most virulent of Jew haters was Mayor. More was lost after they had fled to Amsterdam, and again the Nazis came and they had to flee to the United States. 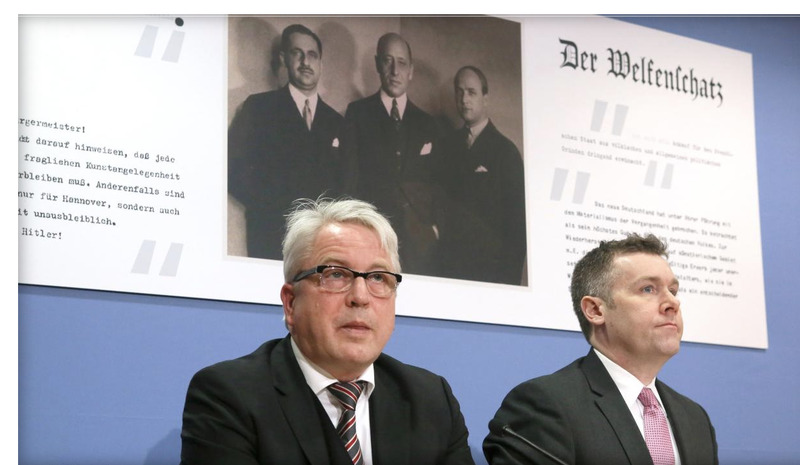 Three years later I became one of the litigants in the case of the Guelph Treasure against Germany and the Stiftung Preußischer Kulturbesitz (SPK), The Prussian Cultural Heritage Foundation, established by the German Government in 1957. 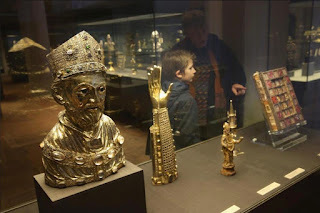 This unparalled collection of medieval ecclesiastical objects, known in German as the Welfenschatz, is now housed in the Bode Museum, in in Berlin. It was purchased in the late 1920’s from a noble family by the firms of three Jewish art dealers in Frankfurt who were later induced to sell most of the collection to the Dresdner Bank for a fraction of its value. The bank was acting for Hermann Goering who intended the Guelph Treasure to be a birthday gift to Hitler. Recently, I was invited to attend a conference in Los Angeles called “The Future of Nazi Looted Art Recovery in the US and Abroad It was an opportunity to meet Nicholas O’Donnell of Sullivan and Worcester in Boston, one of the three lawyers working on the Guelph treasure case that I had not met before, Here is an image of O’Donnell (right) and Markus Stötzel at a press conference on the Guelph Treasure case in Berlin in 2015. Behind them is an image of the three partners in the purchase consortium. The conference was arranged by the L.A. Law Firm Cyprus LLP and lasted a full day from 8am to 6pm. Nicholas O’Donnell was on one of the panels and he did a short summary of our case. 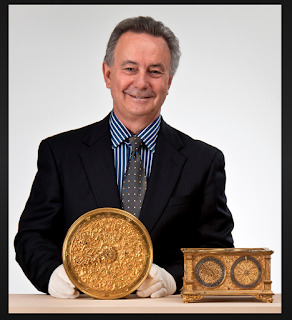 Another panelist I had never met but was a friend on Face Book, was Simon Goodman, author of a book I highly recommend, “The Orpheus Clock” about the search for his family’s looted collection. Also, former generations of our family were friends and had lost touch over time. 2. “Bringing Claims” 3. “What Can Museums Do” and 4. “What Can the Art Market Do”. Also, discussed were issues of litigation (not recommended) and mediation when there is hope of avoiding the former. Out of these headings came some interesting and some arcane material. Under the subject of ways to find evidence of your claim, Professor and author Jonathan Petropolous explained how valuable archives were. Once they have been opened by the government to the researcher, the archive is only as good as its “Finding Aid’, otherwise you might spend your life there without ever finding what you are looking for. Another issue that was brought to the fore was that museums wish to make as much information public as their lawyers will allow because they are in conflict wanting to be open but with a competing desire to hold on to an object they believe they acquired in good faith and with good title. Nicholas O’Donnell has written a book, “A Tragic Fate: Law and Ethics in the Battle over Nazi-Looted Art” dealing with some of these complicated issues. You cannot imagine the variety of circumstances that have resulted in a cadre of lawyers entering this niche of restitution. There are situations such as the individual who emerges from a concentration camp and then finds he has lost his home because he was in arrears on the mortgage. How was he expected to keep up with the payments? What about an individual in Austria who retrieved a collection from the salt mines and then was charged export taxes to leave the country with it. So many stories! Was the conference as exciting as it might sound? Most definitely not! Was it educational from the point of view of hearing from fascinating people including those from museums and counsel from other countries? Most definitely so! Wow Gerald, I love this story. Its quite revealing what the Nazi did. I could just imagine the part about 'the variety of circumstances that have resulted in a cadre of lawyers entering this niche of restitution'. Also, the issue about some museums having 'competing desire to hold on to an object they believe they acquired in good faith and with good title'. Great post.